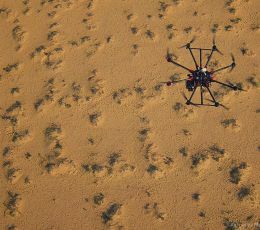 To establish a base in this emerging field within DDCR for the civilian use of aerial photography from Unmanned Aerial Vehicles (UAVs) and demonstrating its values for arid rangelands conservation. Monitor grazing pressure on rangelands, and estimate botanic health of an arid ecosystem. Arabian Oryx, gazelle species, foxes, Gordon’s wild cats, Houbara bustard, birds of prey and Spiny-tailed lizards. Evaluating the extent of damage caused by off-road recreational driving. Increasing the accuracy of ecological maps and consequently habitat classifications. After having the full set (Drone + Software) flights will be strictly limited to the 225km2 DDCR to avoid legal and privacy issues. Calibrating the airborne equipment over different altitudes, time of day and meteorological parameters to assess its abilities and limitations. Routine monitoring at selected elevations, to obtain spatio-temporal data of plant species and dune structure and possibly of some animals. Each designated flight pattern will be recorded once per week for a year. Temporal / Spatial baseline data of vegetation and dune change, related to topographic data; if the opportunity arises to study ephemeral species, then spatial distribution and growth of ephemerals over their lifespan.